These two cute little things were a gift I made a long time ago, but I was recently made aware of the fact that they haven't made it into the blog! Well, we can't have any of that, can we? 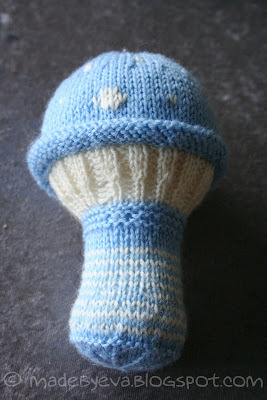 This baby rattle was one of those fun projects I do just to see if I can, and I had some yarn leftovers anyway. It's stuffed with flame retardant batting and a cat's toy for sound. Duplicate stitches create random spots on its cap. The recipe comes from the always excellent Purl Bee! Details on my Ravelry page. On the floor of my bedroom right now, is a stack of papers a mile high... Well, nearly a mile at least. And somewhere deep inside that stack is the recipe and source of this cute baby hat. I'll let you know when if I find it. 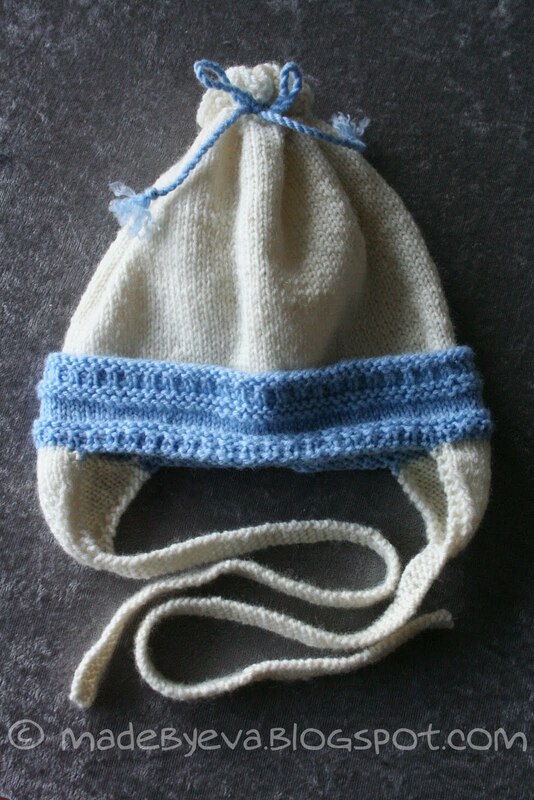 The hat is knitted as a straight cylinder and then pulled together at the top. I kind of fell in love with the pattern at the top and felt really bad about hiding it. It's similar, but even cuter (at least to me), than the pattern on the brim. And just look at those ear flaps, how cute! Details on my Ravelry page.